NEW YORK — In the city that is home to the Statue of Liberty and Ellis Island, 125,000 people, native- and foreign-born alike, turned out April 10 for a historic National Day of Action for Immigrant Justice. It was the city’s largest demonstration so far for immigrant rights. The day of action mobilized some 2 million people in big and small cities and towns nationwide. (See NATIONALCLIPS and our online eXtra for more coverage.) Huge numbers and a festive, family-friendly, working-class spirit have been the hallmarks of this new civil rights movement. New York’s massive show of unity saw labor, religious, ethnic, community, civil rights and peace organizations joining immigrant workers in a strikingly multiracial and multi-ethnic outpouring. 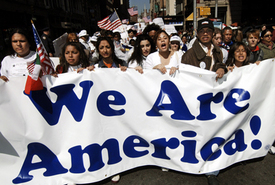 The immigrant rights struggle has sometimes been portrayed as solely a Latino or Mexican issue. But at the New York rally, Catholic, Protestant, Jewish and Muslim clergy, city and state officials, Democratic Reps. Jose Serrano, who is Puerto Rican, and Charles Rangel, an African American, Sens. Hillary Clinton and Charles Schumer, and a wide array of grassroots representatives declared that immigrant rights are important to all American people. Broadway was a sea of color as marchers carried thousands of American flags interspersed with flags of the native lands of the city’s immigrant population — all continents and, it seemed, nearly all countries were represented, from as far away as Senegal, Yugoslavia, Colombia, Ireland and even Australia. The April 10 actions re-energized the immigrant rights movement after a Senate “compromise” fell apart last week. The message to President Bush and Congress from the nationwide actions was, “We are not criminals.” Immigration legislation cannot criminalize the undocumented, the marchers declared, and must include a path to legalization and citizenship for the 12 million people who work hard yet are forced to live in the shadows. Legislation must provide for united families and civil and workplace rights, speakers emphasized. Public opinion backs the demand for a path to citizenship. In a new Washington Post-ABC News poll 63 percent favored letting immigrants who have lived in the country a certain number of years apply for legal status and eventually become citizens. Only one in five embraced the criminalization measures in House bill HR 4437. And 61 percent disapprove of President Bush’s handling of immigration reform. “We are all immigrants,” said United Federation of Teachers President Randi Weingarten. “We cannot turn our backs on our country and our people. We need to roll back the House of Representatives.” She added that teachers do not want to be “snitches” or spy on their students, as HR 4437 calls for. Roger Toussaint, head of Transport Workers Union Local 100, did not speak as scheduled, because he was in court, where he was sentenced to 10 days in jail for leading a pre-Christmas transit strike. When rally emcee Hector Figueroa of SEIU Local 32BJ hailed Toussaint, originally from Trinidad, as an immigrant worker the crowd erupted with a stormy solidarity ovation.